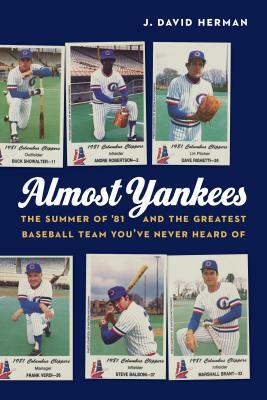 Almost Yankees is a poignant and nostalgic narrative of the lives and travails of Minor League Baseball, focusing on the 1981 championship season of the New York Yankees’ Triple-A farm club, the Columbus Clippers. That year was especially notable in the annals of baseball history as the year Major League Baseball went on strike in midseason. When that happened, the Clippers were suddenly the best team in baseball and found themselves the focus of national media attention. Many of these Minor Leaguers sensed this was their last, best chance to make an impression and fulfill their dreams to one day reach the majors. The Clippers’ raw recruits, prospects, and Minor League veterans responded to this opportunity by playing the greatest baseball of their lives on the greatest team most of them would ever belong to. Then the strike ended, leaving them to return to their ordinary aspirational lives and to be just as quickly forgotten. Almost Yankees is the previously untold baseball story of a team and its players performing in the shadow of one of the sport’s most famous teams and infamous owners. Featuring interviews with more than thirty former players (including Steve Balboni, Dave Righetti, Buck Showalter, and Pat Tabler) and dozens of other baseball and media figures, this season’s narrative chronicles success, failure, resilience, and redemption as told by a special group of players with hopes and dreams of big-league glory. J. David Herman, who worshipped the team as an eleven-year-old, tracked down his old heroes to learn their stories—and to better understand his own. The season proved to be a launching pad for some, a final chance for others, and the end of the dream for many others. J. David Herman is a former newspaper sports writer who joined MSNBC.com to assist with coverage of the 2000 Summer Olympics. He stayed on as a news producer and later became a lead editor for Olympics.com during the 2002 Winter Olympics. He has worked at MSN.com in numerous roles over the past sixteen years, including his current position as a senior managing editor for Microsoft News.